Once you have ruled out physical damage such as cancer, infection, fracture and auto immune diseases chronic pain is caused by the brain. There is mounting evidence to support that pain is your body’s way of protecting you from unresolved emotional turmoil, be it in the past or the present. Out bodies and minds are intrinsically linked and learnt neural pathways can trigger feelings of pain. What’s even more exciting is that those neural pathways are not hard wired, they can be updated and changed, therefore recovery from Chronic Pain is absolutely possible. I’d like to help explain a little more about how chronic pain and the brain are interlinked. Below is a video by Lorimer Moseley, a leading scientist within this field. Back pain, neck pain, hip pain, shoulder pain and any other aches and pains. A normal sign of ageing? Research has shown that disc degeneration, disc bulges and annular fissure are a normal part of ageing and have found no correlation with pain. 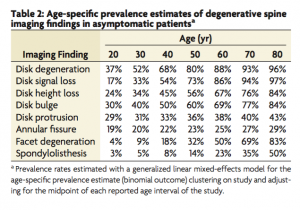 This table shows the prevelance of these imaging finding in asymptomatic patients i.e. those that experience no pain. "Zoe is a very calm and caring person. She is a good listener always able to offer assistance and advice. You gave me excellent support and hypnotherapy which has greatly helped in my recovery. Thank you"
My approach focuses on recovery rather than just managing your symptoms. It’s an educational, empowering approach which help you identify and change the route causes of your chronic pain symptoms. Zoe is a qualified hypnotherapist, NLP practitioner and TMS/SIRPA Pain Recovery Specialist. 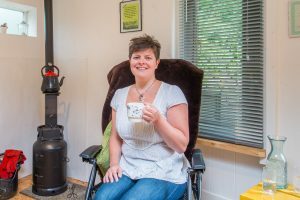 Zoe is passionate about helping people find freedom from the anxieties, stress illnesses, chronic pain and other issues that prevent fulfillment in life and work. Zoe has 10 years experience in helping people and teams make positive change so they feel happier and healthier in their life. You can read more about Zoe here. Step 1 – The first step is a complimentary mindset review, this is an opportunity to chat either online or over the phone to learn more about your specific experiences. It’s also a chance to answer any questions you have. Step 2 – If we decide my services are right for you we’ll begin with an in-depth assessment, helping you connect the dots and understand what is contributing to your chronic pain/TMS symptoms. Step 3 – Following your assessment we’ll design an individual treatment plan to tackle any elements which came up in the assessment. You’ll have 1-2-1 sessions either in person or online. Step 4 – Your plan will also be supported by online tools which are available 24/7 so you can deepen your understanding and improve your mental toolkit in the comfort of your own home. If you would like support with your Chronic Pain or support for your employee wellbeing, click below to book a complimentary mindset review.